Isn’t May a glorious month? Suddenly so much to choose from! So when picking a quick hand-tied posy for a gardening friend this afternoon, I had no trouble in finding a good handful of airy, laid-back stems. Here we have an allium from my cutting bed, the last of the Narcissus ‘Cheerfulness’, Geum ‘Leonard’s Variety’, bleeding hearts, chive flowers, foraged cow parsley, an elegant buttercup that sprung up among my delphiniums, a final grape hyacinth, Geranium phaeum, forget-me-nots, and a stem of ornamental thistle. I also took my friend a courgette plant and a tray of other small seedlings and bits and bobs, and in return received one of her courgettes (a different variety), a geum ‘Totally Tangerine’, and some tiny aquilegias. We while away a happy afternoon in her garden, admiring her plants, drinking tea, exchanging ideas, and steadfastly not revising for our forthcoming RHS exams. 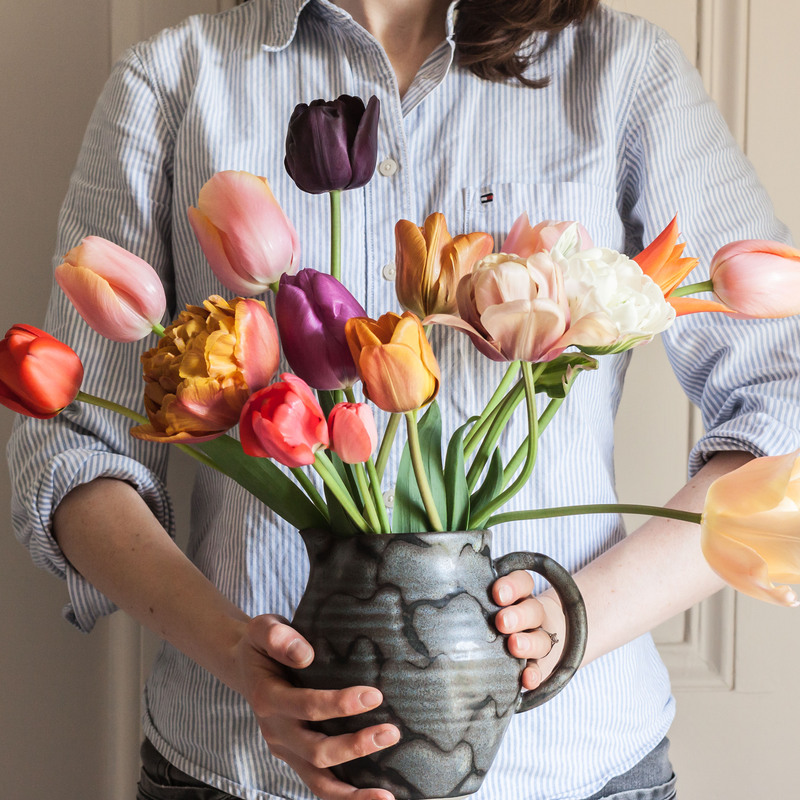 In a Vase on Monday is hosted by Cathy at Rambling in the Garden and I always enjoy visiting her page and following links to all the other vases created by garden bloggers around the world. What a sweet delicate vase….very lovely! I love the combination of flowers. Lovely, light and airy, and colorful. Oh, that’s wonderful to hear. I do hope you do exactly that! What a difference those long stems create. Without them, it would be a too full bouquet, so like the ones most of us make. I say this as one who usually stuffs jam jars when bringing flowers to friends. Thank you Linda. Jam jars are wonderful flower-transporting devices, aren’t they! I love the naturalistic flower arrangement and the photographic style you’ve used suits them perfectly. Delightfully natural and airy – it is a lovely bouquet, Joanna! A lovely airy gift bouquet. I love how you’ve photographed it too. Good luck with the exams. This airy arrangement is so beautiful. Thank you for sharing the spring glory! The whole jar is just stunning. I especially love the photo of the cow parsley, and the Geum. Your flowers have captured the season beautifully as we cross into early summer! Love your photos! Sam, I have stacks of this geum, so let me know if you would like me to send you a bus-load of it, or even just a little bit! Glad you are not regretting agreeing to some briza – I think I pulled out too many seedlings last year as I hardly have any at the moment!! And were you implying you didn’t want any Geum rivale? Thank you for your comment and kind words Amanda – just popping over to visit your blog now. Thank you. I hope you enjoy your visit to the running wave. I live just outside Edinburgh, in East Lothian, so there will be views you might recognise!